China is the centre of tea and so there are very many kinds. When someone mentions tea in China we tend to associate it with oolong tea, but actually this is only a regional tea from Fukkensho Province. 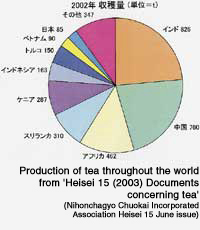 Three quarters of Chinese tea is the green tea that is drunk in Japan. However, whereas Japanese green tea is steamed to prevent fermentation, Chinese tea is boiled directly in the kettle so it has a different flavour and aroma. There is also jasmine tea which is made by adding jasmine flowers to oolong tea or to green tea, which gives the tea a special aroma. This is very popular in China. Then there is black tea which is made in Kimon, dancha which is made in Shisensho and Konansho, and mecha ginshinbyakugo tea which is made mainly from tea buds. There are many kinds, the choice tea of each area loved by the people. Oolong tea has a special aroma because it is partly fermented. In Fukkensho there is a way of drinking tea called konfucha using a small teapot and a tea cup that is a little bigger than a sake cup. The literati used this way of drinking to bring out the subtle aroma and flavour of oolong tea. Probably this way of drinking konfucha and the utensils used for it influenced Senchado (the way of drinking Japanese green tea).